Get it Off Your Chest! You Thought You Had It Bad! When Does a Writer Become a Real Writer? My stepson drove us up to the old mountain kingdom of Nan this year for the first time. Neither he, his wife nor their sixteen-month-old baby had been there before, so the five of us went and we treated them to a night in the capital of the province, which is also called Nan. He turned out to be a better driver than I had expected, and slower than most Thai men, but that could have been because his mother and wife were on the back seat. It was a very pleasant 287km journey, all uphill until we crested the mountains and cruised the last fifty kilometres gently down into the city in the mountain basin. The trip from Uttaradit to Nan is so beautiful, if you like vistas of forest-clad slopes, which I do. There is a tribe still living in there that the West didn’t ‘discover’ until about 1976. Look it up on Wikipedia under Nan Province. That means that my house is less than 200 miles from a Stone Age civilization! That is difficult to fathom when you were a boy from South Wales. Anyway, the visa has been applied for and the night is ours, not that there is anything to do in Nan. It is like its neighbour Laos, and to which its people felt/feel closer (Nan sided with Laos and North Vietnam), everything that I know of closes at nine p.m. I am sitting in the only shop that I know that sells beer to write this too and I am in the city centre five yards from the city’s biggest market. That probably gives as good an impression of the place as any. I have been coming to this shop, run by two old sisters, on every visa run for about seven years, but they never show any sign of recognizing me. The government forces foreigners who live in certain provinces to come here for their visas, probably to open the place up a bit, but there is absolutely nothing for us to do. The city is crying out for a few bars where we visa-hunters can while away the evening. Frank and Joy head for Calle Goya in Fuengirola on the Costa del Sol, Spain, but unexplainable occurrences turn their dream honeymoon into a nightmare bringing them both to the verge of madness! 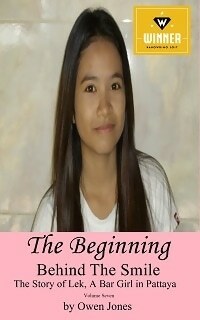 Lek was born the eldest child of four in a typical rice farming family. She did not expect to do anything any different from the other girls in her class in the northern rice belt of Thailand six hundred kilometres north of Pattaya. This is our unique interview with the award-winning American author and screenwriter Donald L Vasicek, in which he talks about his work and his life. « Chase Me, Chase Me! No books currently in progress. Come back soon for updates! Let Us Help You Get Your Book Off The Ground! Copyright © 2019 Megan Publishing Services. All Rights Reserved.